Today, rice (Oryza species) feeds more than half the world's population and accounts for 20 percent of the world's total calorie intake. Although a staple in diets worldwide, rice is central to the economy and landscape of wider East Asian, Southeast Asian, and South Asian ancient and modern civilizations. Particularly in contrast to Mediterranean cultures, which are primarily based on wheat bread, Asian cooking styles, food textural preferences, and feasting rituals are based on consumption of this vital crop. Rice grows on every continent in the world except Antartica, and has 21 different wild varieties and three distinct cultivated species: Oryza sativa japonica, domesticated in what is today central China by about 7,000 years BCE, Oryza sativa indica, domesticated/hybridized in the Indian subcontinent about 2500 BCE, and Oryza glabberima, domesticated/hybridized in west Africa between about 1500 and 800 BCE. The oldest evidence of rice consumption identified to date is four grains of rice recovered from the Yuchanyan Cave, a rock shelter in Dao County, Hunan Province in China. Some scholars associated with the site have argued that these grains seem to represent very early forms of domestication, having characteristics of both japonica and sativa. Culturally, the Yuchanyan site is associated with the Upper Paleolithic/incipient Jomon, dated between 12,000 and 16,000 years ago. Rice phytoliths (some of which appeared to be identifiable to japonica) were identified in the sediment deposits of Diaotonghuan Cave, located near Poyang Lake in the middle Yangtse river valley radiocarbon dated about 10,000-9000 years before the present. Additional soil core testing of the lake sediments revealed rice phytoliths from rice of some sort present in the valley before 12,820 BP. However, other scholars argue that although these occurrences of rice grains in archaeological sites such as Yuchanyan and Diaotonghuan caves represent consumption and/or use as pottery temper, they do not represent evidence of domestication. Oryza sativa japonica was derived solely from Oryza rufipogon, a poor-yielding rice native to swampy regions that required intentional manipulation of both water and salt, and some harvest experimentation. Just when and where that occurred remains somewhat controversial. There are four regions that are currently considered possible loci of domestication in China: the middle Yangtze (Pengtoushan culture, including such sites as at Bashidang); the Huai River (including the Jiahu site) of southwest Henan province; the Houli culture of Shandong province; and the lower Yangtze River Valley. Most but not all scholars point to the lower Yangtze River as the likely origin location, which at the end of the Younger Dryas (between 9650 and 5000 BCE) was the northern edge of the range for O. rufipogon. Younger Dryas climatic changes in the region included the increase of local temperatures and summer monsoon rainfall amounts, and the inundation of much of the coastal regions of China as the sea rose an estimated 200 feet (60 meters). Early evidence for the use of wild O. rufipogon has been identified at Shangshan and Jiahu, both of which contained ceramic vessels tempered with rice chaff, from contexts dated between 8000–7000 BCE. Direct dating of rice grains at two Yangtse river basin sites was reported by Chinese archaeologists led by Xinxin Zuo: Shangshan (9400 cal BP) and Hehuashan (9000 cal BP), or about 7,000 BCE. By about 5,000 BCE, domesticated japonica is found throughout the Yangtse valley, including large amounts of rice kernels at such sites as TongZian Luojiajiao (7100 BP) and Hemuda (7000 BP). By 6000–3500 BCE, rice and other Neolithic lifestyle changes were spread throughout southern China. Rice reached Southeast Asia into Vietnam and Thailand (Hoabinhian period) by 3000–2000 BCE. The domestication process was likely a very slow one, lasting between 7000 and 100 BCE. Chinse archaeologist Yongchao Ma and colleagues have identified three stages in the domestication process during which rice slowly changed eventually becoming a dominant part of local diets by about 2500 BCE. Changes from the original plant are recognized as the location of rice fields outside of perennial swamps and wetlands, and non-shattering rachis. Although scholars have come close to a consensus concerning the origins of rice in China, its subsequent spread outside of the center of domestication in the Yangtze Valley is still a matter of controversy. Scholars have generally agreed that the originally domesticated plant for all varieties of rice is Oryza sativa japonica, domesticated from O. rufipogon in the lower Yangtze River Valley by hunter-gatherers approximately 9,000 to 10,000 years ago. At least 11 separate routes for the spread of rice throughout Asia, Oceania, and Africa have been suggested by scholars. At least twice, say scholars, a manipulation of japonica rice was required: in the Indian subcontinent about 2500 BC, and in West Africa between 1500 and 800 BCE. For quite some time, scholars have been divided about the presence of rice in India and Indonesia, where it came from and when it got there. Some scholars have argued that the rice was simply O. s. japonica, introduced straight from China; others have argued that the O. indica variety of rice is unrelated to japonica and was independently domesticated from Oryza nivara. Other scholars suggest that Oryza indica is a hybrid between a fully domesticated Oryza japonica and a semi-domesticated or local wild version of Oryza nivara. Unlike O. japonica, O. nivara can be exploited on a large scale without instituting cultivation or habitat change. The earliest type of rice agriculture used in the Ganges was likely dry cropping, with the plant's water needs provided by monsoonal rains and seasonal flood recession. The earliest irrigated paddy rice in the Ganges is at least the end of the second millennium BC and certainly by the beginning of the Iron Age. The archaeological record suggests that O. japonica arrived in the Indus Valley at least as early as 2400–2200 BCE, and became well-established in the Ganges River region beginning around 2000 BCE. However, by at least 2500 BCE, at the site of Senuwar, some rice cultivation, presumably of dryland O. nivara was underway. Additional evidence for the continuing interaction of China by 2000 BCE with Northwest India and Pakistan comes from the appearance of other crop introductions from China, including peach, apricot, broomcorn millet, and Cannabis. Longshan style harvest knives were made and used in the Kashmir and Swat regions after 2000 BCE. Although Thailand certainly first received domesticated rice from China–archaeological data indicates that until about 300 BCE, the dominant type was O. japonica–contact with India about 300 BCE, led to the establishment of a rice regime that relied on wetland systems of agriculture, and using O. indica. Wetland rice–that is to say rice grown in flooded paddies–is an invention of Chinese farmers, and so its exploitation in India is of interest. All species of wild rice are wetland species: however, the archaeological record implies that the original domestication of rice was to move it into a more or less dryland environment, planted along the edges of wetlands, and then flooded using natural flooding and annual rain patterns. 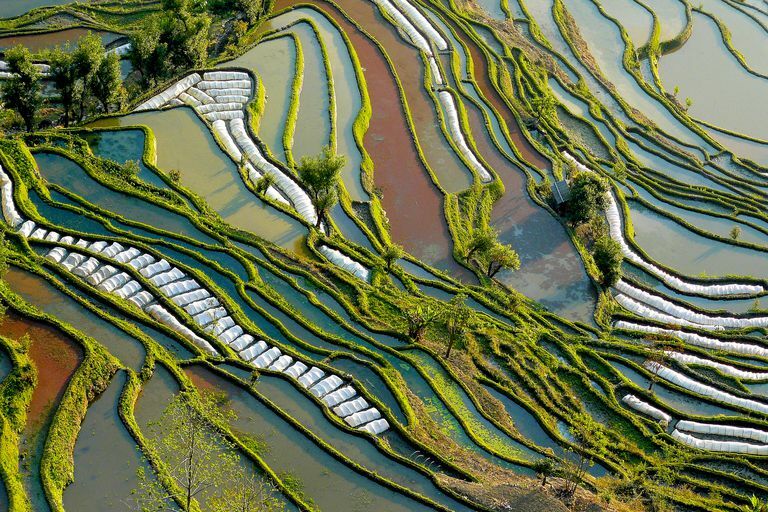 Wet rice farming, including the creation of rice paddies, was invented in China about 5000 BCE, with the earliest evidence to date at Tianluoshan, where paddy fields have been identified and dated. Paddy rice is more labor-intensive then dryland rice, and it requires an organized and stable ownership of land parcels. But it is far more productive than dryland rice, and by creating the stability of terracing and field construction, it reduces environmental damage caused by intermittent flooding. In addition, allowing the river to flood the paddies replenishes the replacement of nutrients taken from the field by the crop. Direct evidence for intensive wet rice agriculture, including field systems, comes from two sites in the lower Yangtze (Chuodun and Caoxieshan) both of which date to 4200–3800 BCE, and one site (Chengtoushan) in the middle Yangtze at about 4500 BCE. A third domestication/hybridization appears to have happened during the African Iron Age in the Niger delta region of west Africa, by which Oryza sativa was crossed with O. barthii to produce O. glaberrima. The earliest ceramic impressions of rice grains date from between 1800 to 800 BCE in the side of Ganjigana, in northeast Nigeria. documented domesticated O. glaberrima has first been identified at Jenne-Jeno in Mali, dated between 300 BCE and 200 BCE. French plant geneticist Philippe Cubry and colleagues suggest that the domestication process may have been begun about 3,200 years ago when the Sahara was expanding and making the wild form of rice harder to find. Cubry, Philippe, et al. "The Rise and Fall of African Rice Cultivation Revealed by Analysis of 246 New Genomes." Current Biology 28.14 (2018): 2274–82.e6. Print. Ma, Yongchao, et al. "Rice Bulliform Phytoliths Reveal the Process of Rice Domestication in the Neolithic Lower Yangtze River Region." Quaternary International 426 (2016): 126–32. Print. Shillito, Lisa-Marie. "Grains of Truth or Transparent Blindfolds? A Review of Current Debates in Archaeological Phytolith Analysis." Vegetation History and Archaeobotany 22.1 (2013): 71–82. Print. Win, Khin Thanda, et al. "A Single Base Change Explains the Independent Origin of and Selection for the Nonshattering Gene in African Rice Domestication." New Phytologist 213.4 (2016): 1925–35. Print. Zheng, Yunfei, et al. "Rice Domestication Revealed by Reduced Shattering of Archaeological Rice from the Lower Yangtze Valley." Scientific Reports 6 (2016): 28136. Print. Zuo, Xinxin, et al. "Dating Rice Remains through Phytolith Carbon-14 Study Reveals Domestication at the Beginning of the Holocene." Proceedings of the National Academy of Sciences 114.25 (2017): 6486–91. Print. Who Gets the Credit for Taming the Wild Jungle Fowl?